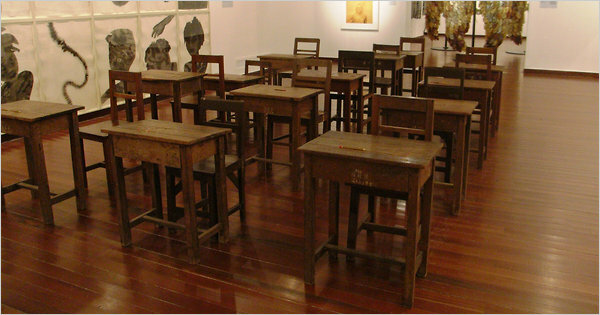 Fourteen old-fashioned children’s school desks are neatly installed in rows. The wooden desktops are carved with barely visible images of contentious events and figures in Thai history that are brought to life when visitors sit down and start rubbing the images with a crayon on paper to reveal them in full. The installation “History Class” by the Thai conceptual artist Sutee Kunavichayanont was first set up in 2000 at the foot of Bangkok’s Democracy Monument to invite people to produce their own history textbooks and reclaim their pasts. The work now takes pride of place in “Negotiating Home, History and Nation: Two Decades of Contemporary Art in Southeast Asia 1991-2011,” a new exhibition at the Singapore Art Museum that runs through June 26. “Negotiating Home, History and Nation” is an ambitious survey of works by 54 artists from six Southeast Asian countries (Thailand, Indonesia, Vietnam, the Philippines, Singapore and Malaysia). It offers a rare chance to experience the diverse yet often related conceptual style and ideological concerns of artists in the region. Among common themes found in the exhibition are the challenge to national power structures and their offshoots — cronyism, authoritarianism, abuse of power, racial policies biases — as well as investigation of cultural identities. “Wayang Legenda Indonesia Baru” (2000), an installation by the Indonesian artist Heri Dono, uses Wayang, or shadow puppets, in the shape of various Indonesian islands to represent the diverse nation, which faced a possible breakup after East Timor seceded in 1998. “Executive Toy” (2004), by the Malaysian artist Sharon Chin, uses 27 pendulum balls to represent each of Malaysia’s political parties, the movement of one creating a ripple effect across them all. A glance around “Home, History and Nation” reveals a preponderance of three-dimensional art, photography and video. Mr. Kunavichayanont created his 1999 inflatable latex The White Elephant, which lies deflated on the floor, in reaction to the Asian financial crisis of 1997-1998. Viewers are invited to inflate the elephant, but the strength required to achieve a full elephant again hints at the economic difficulties ahead. 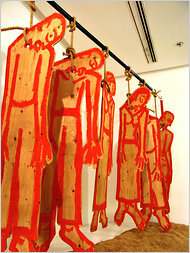 The controversial Thai artist Vasan Sitthiket’s “Committing Suicide Culture: The Only Way Thai Farmers Escape Debt” (1995) is an installation of plywood figures hanging by their necks in the midst of rice husks, a visually arresting political statement on Thailand’s agricultural policy. The Indonesian artist Agus Suwage presents a cabinet filled with books in “Give Me More Questions” (1997) with a superimposed cutout of a boy crouched in fear. The cabinet is surrounded by curtains with prints of the same boy in different positions, including crouching under the burden of books that are supposed to give him knowledge. Spirituality and the role of religion in a society faced with consumerism, shifting sexual mores and corruption is another theme among many of the works. The Thai artist Kamin Lertchaiprasert’s “Lord Buddha Said ‘if you see Dhamma, you see me”’ (2003-4) is a papier-mâché effigy of a walking Buddha made of shredded notes on Thai money sliced horizontally into three parts — each presented separately, lining up one behind another. Read the whole story in the IHT .